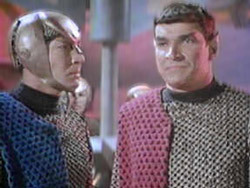 The look of the Romulan is largely based on the appearance of the Romulan Commander (portrayed by the late series veteran Mark Lenard) from "Balance of Terror." 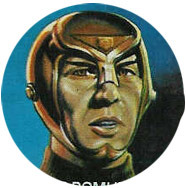 The face sculpt is very close to the actor's likeness, but the outfit itself is only a shadow of the more colorful one seen in the episode. 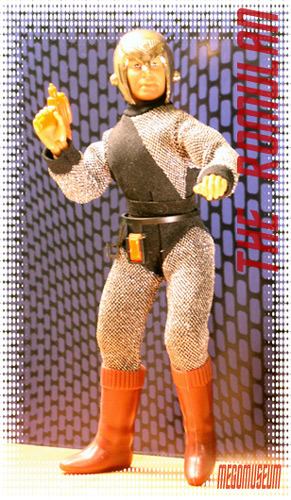 The figure comes clothed in a bodysuit (with sewn-on belt) made from black and black/silver material (reminiscent of the chain mail fabric used for Mego's Knights). 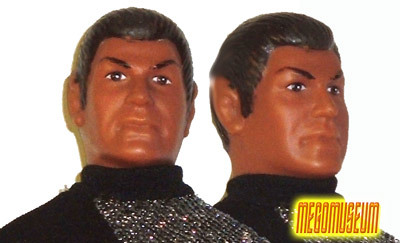 The body used for this figure is a standard, Type 2, male, flesh-colored one (this is worth noting, since the Romulan is the only one of the Aliens whose body is not a weird size or shape!). 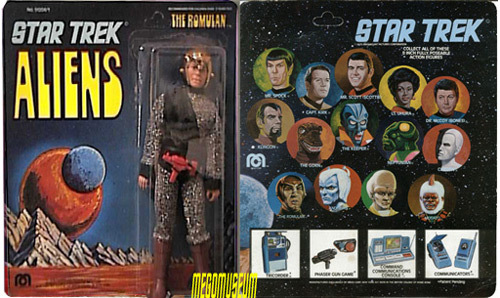 Above is the apple of many a collectors eye, the carded Romulan which only came on this version of card.